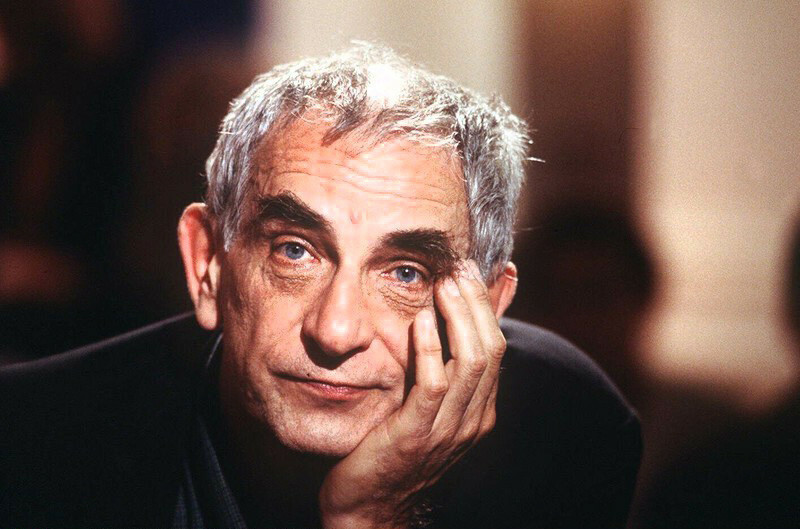 A previously-unpublished series of interviews with the late, great Krzysztof Kieślowski. I can't think of another movie that makes me laugh and cry within the course of its opening shot. This is "The Big Animal" (2000), a feature directed by and starring Jerzy Stuhr, based on an early screenplay by Krzysztof Kieslowski. You may know Stuhr from Kieslowski's first feature, "Camera Buff" ("Amator"), "Three Colors: White," "Dekalog: 10" ("Thou shalt not covet thy neighbor's goods") and other films by Andrzej Wajda, Krzysztof Zanussi and Angieszka Holland. This shot could serve as an introduction -- perhaps an encapsulation -- of a certain Polish sensibility dear to my heart that is both absurd and poignant. It begins in the fog -- at least, we think it's fog, but the way it's blowing it looks more like smoke. Turns out it is smoke, from a pair of circus vans, and as they move past the camera and roll off into the distance, the right side of the frame clears and... there's a camel standing there. The mild existential shock of this opening image sets us up for the satire -- of bureaucracy and toleration of individuality -- that is to come. A man and his wife adopt the stray camel. At first, everyone is happy. A camel is a novelty in this village, and it becomes the man's pride and joy. He is no longer ordinary, but exceptional. He has a camel! But then man-made socio-political reality begins to set in. How do you license a camel? Surely pets must be licensed, but there is no such thing as a camel license (shades of Monty Python's fish license sketch). A dog license is not sufficient -- possibly even illegal -- because, clearly, this creature is not a dog. It's not a horse, either. But do you need a license for a horse? And then there are the townspeople, who begin to wonder: "Why should this man get away with breaking the rules for a camel? Who does he think he is? Why does he need to stand out and flaunt his special status? Such things should not be allowed. Or should they not, at least, be properly taxed?" Kieslowski's screenplay, from the story "The Camel" by Kazimierz Orlos, was written in 1973 as a fable about life in the Soviet bloc. But the 1994 "Bart Gets an Elephant" episode of "The Simpsons," where Homer exploits Stampy to pay the mammoth food bills, provides a capitalistic counterpoint. I love this "Big Animal." "The Big Animal" is available on DVD from our friends Amy Heller and Dennis Doros at Milestone Film & Video.